The stories that moved me were “Coming Home,” “Twilight in Quebec,” and “The Visit.” It was vicarious. Unlike Elmer, I never knew any prisoner who walked from Muntinlupa to Pasay across a devastated landscape where mopping up operations were still in progress, nor have I ever been to solidarity meetings abroad, nor have I ever set foot in “consol” villages that demarcated rural areas into white or red zones. But the stories rang true and were valuable to me for their authenticity …. I wish Elmer would write a novel, a Bildungsroman perhaps. These stories deserve more narrative space. If he does, he would deepen our understanding of these painful episodes in our history. It would be a valuable contribution to our collective memory. What may well be a Bildungsroman is Snows of Yesteryear in two parts, “A Family in War” and “A Sentimental Education”—based on the experiences of the author from his childhood to the war years, his intellectual development, involvement in political struggle, and inevitable retirement. Hence, Snows of Yesteryear is autobiography disguised as a novel. It has elements of a roman à clef in that the author oftentimes uses actual names in the cast of characters. In many parts, the story is creative nonfiction. It aspires to what Rony V. Diaz has written about Sitting in the Moonlight and Other Stories, quoting Rilke: “All art is the result of having been in danger, of having gone through an experience all the way to the end.” Snows of Yesteryear is derived from the genre of ubi sunt writing, which originated in medieval times among writers like François Villon, writer of “Ballade,” about famous women of times past—like Héloïse and Joan of Arc who led tragic lives—using the refrain, “Where are the snows of yesteryear?” The genre has since encompassed “nostalgia literature”—meditations on lives and events that were. 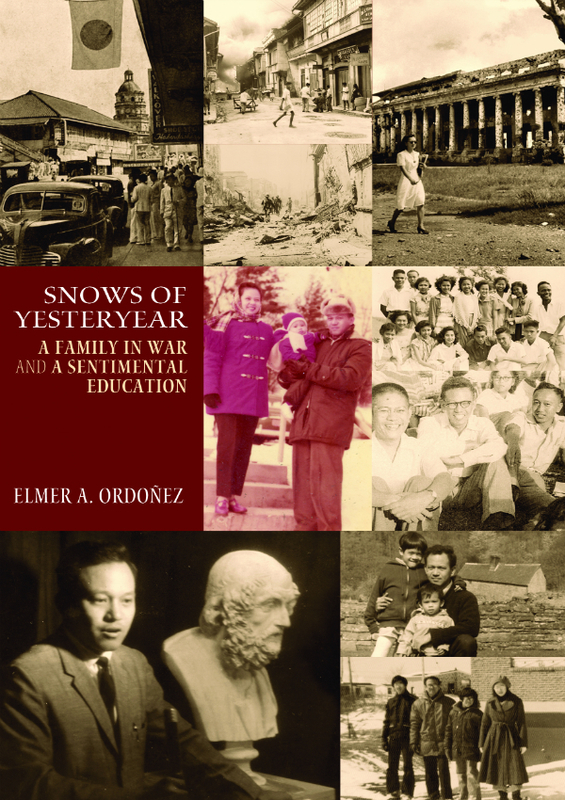 Elmer A. Ordoñez is a literary critic, editor, essayist, and retired professor of English and Comparative Literature from the University of the Philippines Diliman, Quezon City. He finished his AB and MA degrees at UP and his PhD at the University of Wisconsin, Madison. He also taught in the United States, Canada, and Malaysia. His published works include The Early Joseph Conrad, Emergent Literature, Diliman: Homage to the Fifties, The Other View (three volumes), Sitting in the Moonlight and Other Stories, and Red Poppies on the Road (A Memoir). His latest awards include the SEA Write Award (Bangkok), Ani ng Dangal (NCCA), Gawad ng Pambansang Alagad ni Balagtas (UMPIL), and Taboan Lifetime Achievement Award (NCCA).